Bharvan is a Hindi word which means stuffed. Karela is one of the most bitter vegetables, yet it is very popular in India because of its medicinal values. In English karela is known as bitter gourd/bitter melon/ bitter squash. If you live outside India, Karela can be easily found in Indian store, Asian stores and sometimes in regular supermarkets too. You can even grow karela in your kitchen garden. Throughout India different delicacies are made out of this vegetable. Bharwan karele is a very delicious and healthy stuffed vegetable preparation from North Indian. Karele are bitter in taste but I started eating this vegetable when I was very young. When we were growing up, my mother used to cook karele very often in summers when they were in season, so we developed the taste for this bitter vegetables. I know many people don’t like the bitterness of karela. In India, doctors say that karela and methi, the two bitter vegetables are good for diabetics as it keeps the blood sugar under control. Mix salt in the scraped skins. Also apply a small amount of salt to each scraped karelas thoroughly and keep aside for about 30 minutes. This is an important step to remove the bitterness of karele. After about half an hour, wash the skins of the karela in the sieve thoroughly to remove the bitterness and the salt. Squeeze the water off and keep aside. Now wash the karela thoroughly, squeeze the water off and keep aside. In a bowl take the skin of karelas and all the spicess listed above for stuffing. Mix well. If the mixture is too dry, add 1 tsp water or oil. Open the slit of karela and fill the above mixture in it. Repeat with all the karelas. In a frying pan heat 2-3 tbsp cooking oil. arrange all the karelas on the pan. Lower the heat and cook karela for 7-8 minutes. After 7 minutes with the help of tongs change the side of every karela cook . Cook until all the sides are tender and done. Bharvan karelas are ready to serve. Serve with Roti or Plain Paratha. These karela taste very good with dal chawal also. These bharwan karel can be kept in fridge for 10 days. Bharvan Karele are good option to carry with poori/paratha if you are traveling, as it can be kept out side the refrigerator for a week if weather is not very hot. I make the stuffing with onions and also without onions when when we have vaishnav guests. If you are using onions, add 1 medium finely chooped onions in the stuffing masala. Use grated raw mangoes in place of amchoor powder if they are available. My grandmother used to tie the karela with a thick white thread after stuffing it with spices so spices don't come out during cooking . In case if you are tying the karela with thread make sure to remove the thread after the cooking. For stuffed karele recipe small karele would be ideal for stuffing. Karele (bitter gourd)can be easily grown in a home garden. You can also grow them in a big pot. Read more about vegetable gardening. Karela is very popula in India. Throughout India different delicacies are made out of this vegetable. Today we will be making sweet and sour bitter gourd. It is an easy to make, quick, and healthy dish. You can serve khatta meetha karela with paratha or with dal chawal, it always taste good. 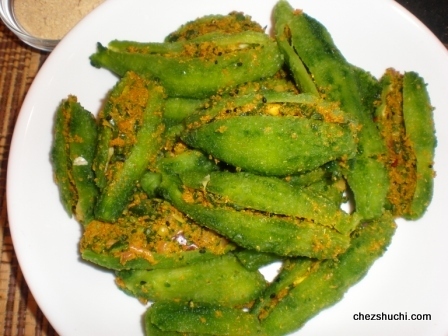 Try this karela recipe and please do share your valuable comments..